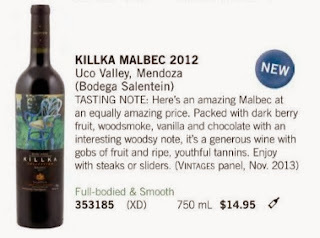 SukasaStyle returns for 2014's first #WineWednesday post with the focus again on value for money in the latest LCBO Vintages release. For the hard earned funds you put aside for a couple of bottles we are going back to the Southern hemisphere with two luscious reds from the land called Silver: Argentina. It is understandable if you feel tapped out after splurging over the Christmas holidays. Not to fear: the country that has produced peerless Maradonna, Messi and Malbec also has a varietal that shouldn't be overlooked: Bonarda. Bonarda, like Malbec, is a foreigner that has found the soil and climate of Mendoza to be more hospitable than that of its native Italy where it hailed from Piedmont. The lighter-bodied and fruity wine is a good alternative for fans of gamay who are looking for a change of pace with richer flavour. 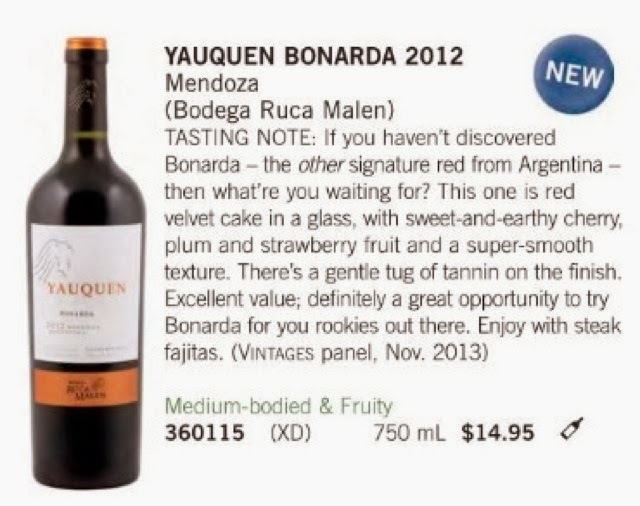 The Yauquen Bonarda 2012 vintage from Bodega Ruca Malen should be served with red meats, pasta with meat sauce, and cheese but is also suitable for sipping. We suggest opening the bottle an hour before serving to let it open up or decant. The second pick is Killka Malbec 2012 produced by Bodegas Salentein from Valle de Uco in Mendoza. This is from the winery's young range portfolio and the classic blackberry, plum and vanilla nose is paired with the structure of a more expensive wine. It is a fruit forward entry but there are smooth tannins to show that it isn't a simple fruit bomb. Like many a malbec we sugest serving this with a roast or grilled red meat. Like the aforementioned bonarda, this would be another decent pairing with pasta with meat sauce and semi to hard cheese. We raise a glass to winemaker Gustave Bauzá for a wonderful entry. It is difficult for domestic producers to match at this price point. Posted by Arijit Banik for SukasaStyle.